This PCIe-NVMe drive posts impressive speeds. Congratulations, OCZ. You can come out of hiding now—no longer are you defined by the bargain-basement Trion line and Toshiba TLC NAND. The RD400 signals that all is again as it should be in OCZ-land. 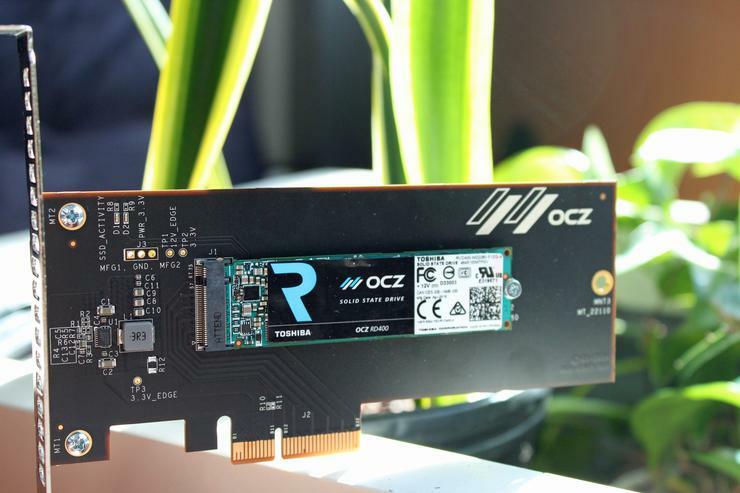 This M.2 PCIe-NVMe SSD reaches a read speed of 2.1GBps, meaning the company is once again shipping products that pursue the limits of performance. Thank goodness. M.2 SSDs span three distinct types: SATA, PCIe-AHCI, and PCIe-NVMe. The first uses the SATA bus that some M.2 sockets implement, and is no faster than 2.5-inch SATA SSDs. The advantages are small size and convenience. The other two types use M.2’s PCIe channels (not all M.2 slots have them) and vary only in the transport protocol: the older AHCI, or the newer NVMe. (The RD400, as mentioned earlier, uses NVMe.) In most designs to date, AHCI can hang with NVMe when writing, at around 1.2GBps, but NVMe is far faster at reading. You’ll usually get 2GBps or more with NVMe compared to AHCI’s range of 1.1GBps to 1.4GBps. The RD400 on its x4 PCIe adapter. Note that even if your M.2 slot supports PCIe, your motherboard’s BIOS must support NVMe to boot from an M.2 PCIe-NVMe drive. Most performance motherboards have been upgraded for this, but many mainstream models have not. Older PCIe-AHCI M.2 drives are far more likely to be hassle-free boot drives. The RD400 tested just a tad slower than its rival, the Samsung 950 Pro, in AS SSD’s sequential tests. It read at about the same 2.1GBps, but was some 200MBps off the pace writing. That may sound like a lot, because the dip from 1.4GBps to 1.2GBps is almost a 15 percent drop-off. But at those speeds, the difference is subjectively unnoticeable. In the 4K threaded tests, the RD400’s results were the inverse of the 950 Pro’s. OCZ’s new drive nearly doubled the 950 Pro’s writing, but fell well short of its rival’s read speed. If you’re running an application that scattershots small writes, then the RD400 might be the better choice. For applications that read from multiple files simultaneously, then the 950 Pro will be what you want. However, threaded file writing is so new to the game that few applications are designed to take advantage of it. Note also that this review’s results were obtained using a beta driver, as we did our testing prior to the product’s launch. The RD400 is quite a bit faster than M.2 PCIe drives from previous generations, like the PCIe-NVMe Samsung SM951, as well as PCIe-AHCI drives like the Samsung XP941 and Kingston’s HyperX Predator. We tested the RD400 on both the bundled x4 PCIe adapter and the M.2 PCIe slot integrated on our test motherboard. Performance was very consistent in AS SSD’s 10GB test, but there were variances of several hundred MBps in the 1GB test from run to run. We’re guessing that the cause is the beta driver used for testing, but it could be caching techniques. Regardless of the reason, it’s still a very fast drive. Part of the performance magic of SSDs is being able to write via multiple paths to multiple chips. We tested the 512GB version of the RD400, which can reach 2.1GBps for read speed and 1.3GBps for write speed. The 1TB version is rated for the same. However, the 128GB version of the RD400 is rated for half of that write speed, and the 256GB version about three-quarters. They read at roughly the same speeds as their larger siblings. Toshiba is notoriously reticent about providing information on the controller and NAND—but my guess is the NAND is either MLC, or TLC being treated as such. All flavors of the RD400 carry a warranty of five years and 74TBW (terabytes written) for every 128GB of capacity. Rumor has it that this drive should exceed that estimate, but even if it doesn’t, that rating’s still on par with competing drives. 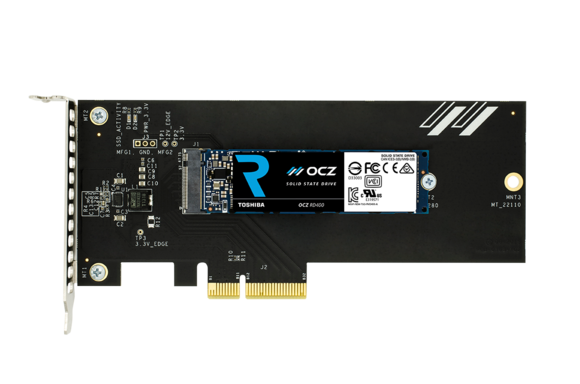 The RD400 itself is an M.2 PCIe SSD that can be used in any computer with an M.2 slot, or a PCIe slot when used with an adapter. NVMe drives still cost quite a bit more than SATA models, but given the tripled speed, it’s a relatively small price to pay. The 128GB version of the RD400 is $110 (86 cents per GB), the 256GB version is $170 (66 cents per GB), the 512GB version $310 (61 cents per GB), and the 1TB version $740 (77 cents per GB). Add $20 to those prices if you want the version of the drive that comes with the PCIe adapter we used during testing. If your system supports NVMe, spend the money. Yes, if you opt for a normal SATA SSD, you’ll be pleased. But if you opt for an NVMe SSD, you’ll be amazed. It really is the best performance upgrade you can buy, bar none. As far as the RD400 is concerned, stick with 256GB capacity or better, unless you’re truly strapped for cash. The 512GB version is the sweet spot in price-per-gigabyte and also offers the best performance.